Colonia (Colonia del Sacramento) is in the Rio de la Plata region of Uruguay. It is filled with old colonial buildings and cobbled streets, and is inscribed on the UNESCO World Heritage List. Colonia del Sacramento (Nova Colonia do Santissimo Sacramento) was founded in 1680 by the Portuguese (Manuel Lobo), sandwiched in between the Portuguese colony of Brazil and the Spanish Vice Royalty of the River Plate (later Argentina, Uruguay and Southern Brazil). Its strategic position and use as a smuggling port meant that its sovereignty was hotly contested and the city changed hands several times between Spain and Portugal. There are a number of boat connections that arrive and depart from Buenos Aires, Argentina throughout the day and these are managed by three companies - Buquebus, ColoniaExpress and Seacat. Colonia Express accepts foreign credit cards. The ferry terminal is undergoing extensive renovations as of November 2018. Colonia Express costs roughly 550-1,000 Argentinian Pesos p/p return and takes roughly one hour to reach Colonia. There is no wifi provided but there is a duty-free shop and a small bar selling snacks and coffees. Seacat costs roughly 1,000 Argentinian Pesos p/p return and takes roughly one hour to reach Colonia. A sometimes cheaper possibility is to take a boat from Tigre to Nueva Palmira in Uruguay. From Nueva Palmira, take a bus, which run every two to three hours from the center of the city to Colonia. Great landscape in bus and spectacular river route in boat. The ferry company bus to Colonia bus station makes the round trip between 30-60 USD, two hours in bus and three in boat. The bus leaves at 2pm from Colonia Bus Station, ask around at ticket counters for current Seacat agent. Slower buses will save you $5-$10 one way over corporate bus, but they will also drops off kids from school along the way. Be warned that Tigre has no major connections outside of Retiro so this route is not convenient to those headed north to Santa Fe province. Nueva Palmira has little to offer so stock up in Tigre or Colonia, and only light snacks and drinks are available in ferry. There are several connections by bus from Montevideo to Colonia, with most buses leaving from Montevideo's Tres Cruces terminal . The ride takes 2.5 to 3.5 hours depending on stops and costs about UYU360 pesos. Be careful with people telling you that all buses are booked out. This is in general not true and a taxi is much more expensive. For the peace of your mind buy a bus ticket upfront to avoid rare disappointment. Colonia is a good for visa runs for those people who wish to extend their stays in Argentina. Shopping however is much more expensive in Colonia than Montevideo. 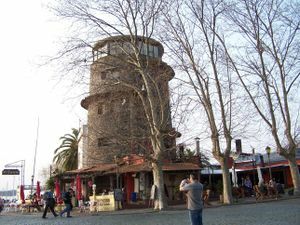 The old city of Colonia, which holds the main attractions, is quite small. It can be easily walked in a single day. There are shops where you can rent bicycles, scooters or golf carts which you can use to ride around the city or in to the countryside. Streets aren't always in perfect condition, so keep an eye on the road, especially cobbled ones. The ferry terminal is about half a kilometre south of the old city and the main bus terminal is about a kilometre south of the city center. You can rent row and sail boats from the marina. 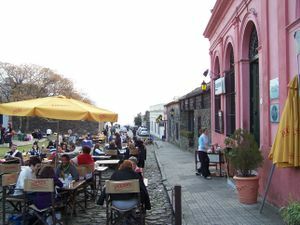 The main attraction of Colonia is its historic center. Eight small museums can be visited with only one cheap entrance ticket which must be purchased in the Museo Municipal (50 Argentinian Pesos). Seven of these museums are in the town center itself but it must be said that although not costly the museums have little to recommend themselves - most only consist of one or two rooms of very uninspiring exhibits. For a few pesos you can go up to the top of the lighthouse (faro) for a view of most of the city and the river. 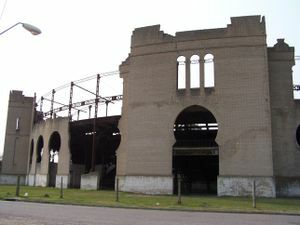 Outside of the city there is a semi-abandoned amusement park with Uruguay's only bullfighting ring, no longer in use. It's closed and fenced off, so you'll only be able to walk around the outside. 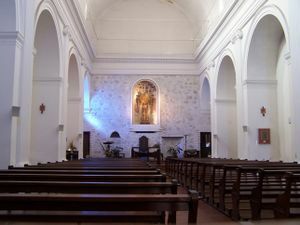 It's about a 5km walk each way from the historic area. There is a large tourist information center adjacent to the ferry terminal, and a small office at the western terminus of Calle Manuel Lobo. The old city is full of restaurants which serve the weekend tourist crowd from Buenos Aires. The specialties are Italian and asado (barbeque). Colonia was also settled by Swiss immigrants and is home to a unique local Swiss cheese that you can get at the markets. Hostel Colonial, Av. General Flores 440, 052-28151 ([email protected]). Nice basic hostel, with Internet and shared kitchen. Dorms from USD 18. El Viajero Hostel, Washington Barbot 164, Phone +59852 22683, Email: [email protected], . Dorms from USD 30 . Well-run, clean, friendly hostel just a few metres from the historic old city. WiFi, computers, kitchen, great common area. Live music on the weekends. Colonia is a preserved tourist town with very little of the harassment seen in most cities in Latin America. The dominance of local weekenders from Buenos Aires and Montevideo creates a very different environment from other tourist cities. There are frequent buses to Montevideo and several time a day ferries to Buenos Aires and El Tigre in Argentina. Three ferry companies currently (Nov. 201) run between Colonia and Buenos Aires: ColoniaExpress, Buquebus, and SeaCatColonia. This page was last edited on 6 December 2018, at 02:46.